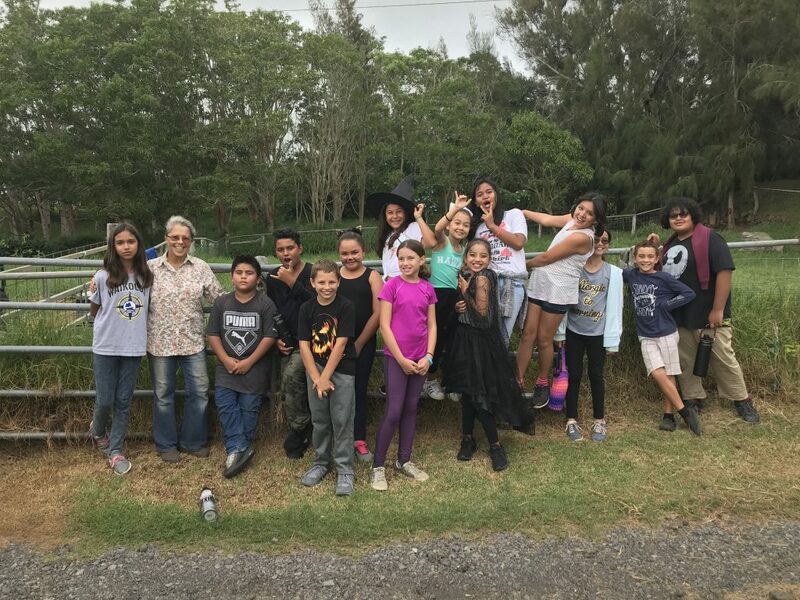 The Future Foresters program is in full swing at the Waikoloa Dry Forest Preserve! This year started off with a bang with an impressive amount of student interest in our afterschool program. With so many eager applicants, we extended our program to four days a week to accommodate the demand. Currently, 56 students ranging from fourth through seventh grade make their way to the preserve each week to participate in our outdoor learning curriculum. Our first sessions consisted of our new and returning students becoming familiar with the abundance of native plants that now reside within the dry forest preserve. As we hiked through the vegetation, students marveled at the size and age of the wiliwili trees as well as the amount of effort, time and dedication it takes to restore a dryland forest ecosystem that has all but disappeared. We went on to discuss the importance of scientific observation and how to properly record this information in their field notebooks. Each student was given the opportunity to adopt a specific plant to monitor and continue to care for throughout the year. Students recorded information about their native plants, including their traditional uses, species characteristics and Hawaiian name. As many of the students have found out, eradicating non-native plants is a large part of making sure native dryland species thrive. They are more than eager to regularly don work gloves and pickaxes to help remove these harmful intruders. As our preserve boasts a somewhat difficult climate and terrain, safety remains a main priority during our program. During our first aid lesson, the students learned how to properly prevent and respond to field related injuries. Through various scenarios, the students were able to put their skills to the test when responding to minor abrasions, open wounds, broken bones, and heat-related illnesses. Each week, one student is selected to be the medic. Their role is to carry the first aid kit, wear the medic armband and serve as the first responder to any and all injuries that may occur that day. The students have shown great responsibility in this task and take pride in making sure their fellow foresters remain safe on our excursions. Waikoloa Dry Forest Initiative is not only committed to the restoration of the tropical dry forest habitat, but to ensuring that these resources are around for generations to come. Our mission in the Future Foresters program is to provide a science and conservation-based curriculum meant to foster the next generation of environmental stewards. For as we know, “E mālama ‘ia nā pono o ka ‘āina e na ‘ōpio”– the traditions of the land are perpetuated by its youth.